This module (incode-module-minio-dom) and its various submodules provides a libray for archiving BLOBs from a domain entity and persisting them instead using Minio. The idea is that domain entities such as documents, that large blob/clob content initially persist that content "in-line". At some later point, that content is copied from the domain entity into Minio, and then that content is removed. In its place the URL of the content as persisted in Minio is stored as a pointer. Most of the functionality provided by this module is intended to be used by an integration solution - such as Apache Camel - rather than an Apache Isis domain application, and can be used "as-is". The module also provides an SPI for the Apache Isis domain app to implement, acting as a bridge to the specifics of the domain app and the entities it may require archiving. calls DocBlobClient to obtain a list of all documents that need to be archived. The DocBlobClient is the incode-module-minio-docclient submodule. The DocBlobClient in turn makes a REST call to DocBlobService, hosted by the Apache Isis webapp. The DocBlobService is in the incode-module-minio-docserver submodule, and so this is the one dependency that an Apache Isis webapp has on the Minio library. within the Apache Isis webapp, the DocBlobService delegates to the DocBlobServiceBridge. This is an SPI that the consuming application is required to implement. Typically this is likely to delegate to some repository service to obtain entity/ies that have blobs, eg documents. for each of the returned blobs, the MinioArchiver then calls the MinioBlobClient to upload the blob into Minio itself. This returns back a URL. The MinioBlobClient is in the incode-module-minio-minioclient submodule. for each blob and its corresponding URI, the MinioArchiver then calls the DocBlobClient once more, this time to indicate that the blob has been archived. the DocBlobClient in turn again makes a REST call up to DocBlobService, hosted on the Apache Isis webapp. once more the DocBlobService delegates to the DocBlobServiceBridge SPI. The implementation of this (provided by the consuming application) will typically delete the blob from the original entity, and in its place store the URI as a pointer to Minio. It’s the responsibility of the consuming application to download the content from Minio (using the URL); this library does not (currently) provide any utility services for this. The MinioArchiver described above is packaged as a library, so will typically be called periodically from some sort of integration solution. As the diagram above suggests, this could be accompllished using Apache Camel, whereby a MinioArchiverProcessor (not part of this library) acts as a simple wrapper that calls the MinioArchiver. That processer in turn might be scheduled to run periodically, say once an hour. When first deploying this solution, there will probably be a need to archive historical blobs. The Main utility in the incode-module-minio-minioarchtool is a standalone utility that simply calls the MinioArchiver to archive all. "cust.Customer/1234" is the identifier of (in this case) a customer. It corresponds to the bookmark of the Apache Isis application (having replaced '/' with ':'). The above scheme means that only one blob can be persisted per object instance. A future enhancement would be to allow multiple blobs to be persisted (corresponding to different properties of the original entity in the Apache Isis webapp). 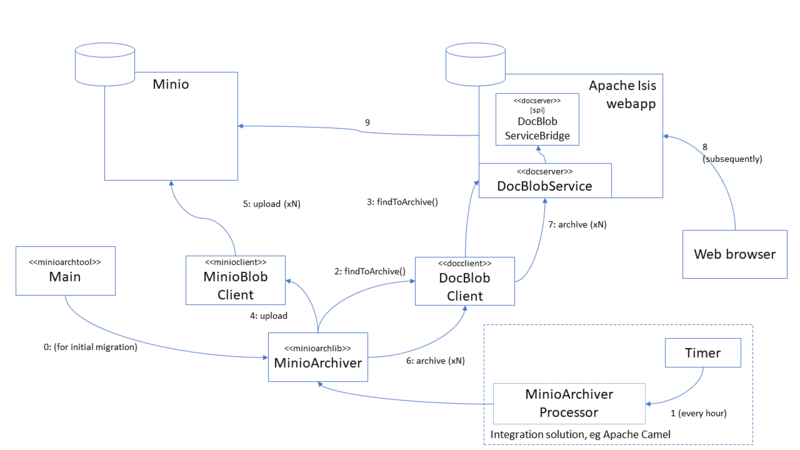 This section describes how to configure and use the minio library within the integration solution (eg Apache Camel), ie that periodically invokes the MinioArchiver. This invokes the MinioArchiver up to 5 times. The idea here is to allow the archiving to be performed in batches, avoiding very large database updates during initial migration of blobs from the Apache Isis webapp and into Minio. minio.bucket - as explained in the above section on the URL format, typically indicates the "environment"
This section describes the responsibilities of the Apache Isis webapp that has domain entities with blobs that are to be archived. 1 Bookmark of the persisted entity which holds the blob to be archived (or may have been archived). The DocBlobServiceBridge SPI is slightly inconsistent; the archive(…​) method ought to take a DocBlob rather than a docBookmark. The SPI service implementation must be included in the application bootstrapping. Typically this is done by defining an owning Module and then including that module in the application’s AppManifest. This implementation only supports one blob/clob property per domain type. It also doesn’t distinguish between different domain types which may require archiving. This makes it the responsibility of the SPI to "assemble" the lists of all domain entities which may require archival (eg Documents, Commands, PublishedEvents) rather than each being archived separately. For the Apache Isis webapp, this library has no dependencies.